Now that we're officially in Spring I've been wanting to give our bedroom a bit of a Spring makeover and the easiest way to do that is simply to buy new bed linens. New bed linens can completely transform the look and feel of a room and add some much needed colour, especially when you're transitioning from Winter to Spring. 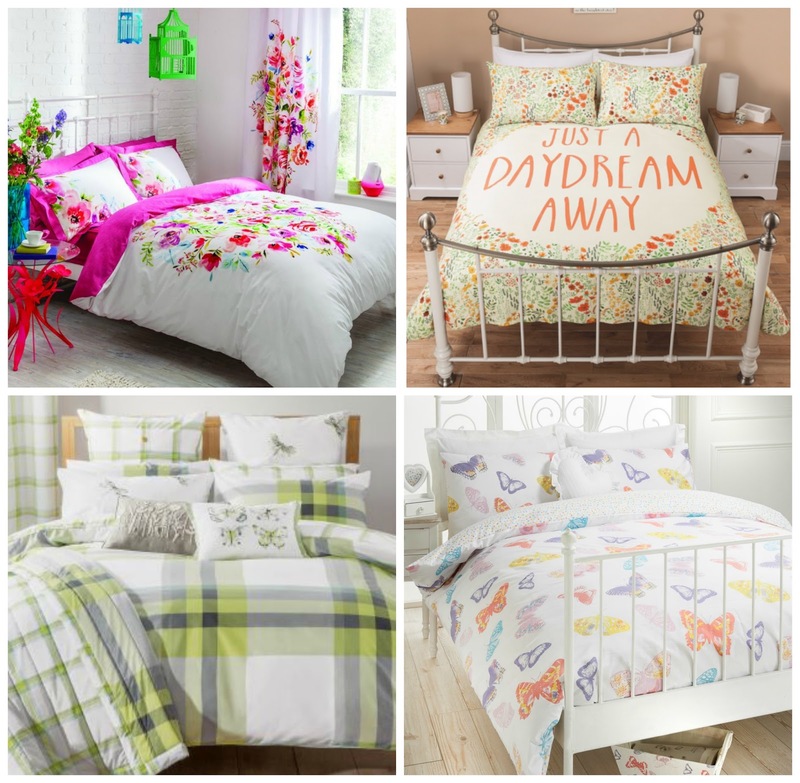 I've chosen four of my favourite bed linens that I think would be perfect to give our room a more Spring like feeling and brighten up our very grey and dull bedroom. We have a king size bed but we have a super king size duvet to make sure we're not fighting over the covers, Yorkshire Linen's super king bed linens are some of the best I've found as we sometimes struggle to get hold of super king size bedding but they have a huge range and they're all gorgeous. The first set is a Bright Floral Duvet Set from Yorkshire Linen, I think the colour scheme is perfect for Spring and Summer, the hot pink really adds some vibrant colour to the room and then there's the perfect mix of white and florals which compliment each other really well and would make any room look fresh and bright this Spring. Next is a set from Asda, it's pretty floral design reminds me of a meadow full of wildflowers and would make any bedroom feel like Spring. I also like the quote on the bedding, I think it's cute and something a little different. The next set is very country style which would suit our home really well, I love the pale green, white and grey colour scheme and also the check design. The little touches with the butterflies also is a great little addition and would liven up most bedrooms, this set is from Next. Lastly is a set from Matalan which is covered in beautiful pastel coloured butterflies and really gives a look of Spring time. The design is really simple but it's super effective and would make our bedroom feel really light, bright and clean. Any of these bed sets would work great to give our bedroom a Spring makeover, I'm still undecided which one I like best. Let me know which one you like best.